I bought this sight unseen from a school auction. Being a former shop teacher I know how used, abused and thrashed some machines get before going to auction. I had a feeling this one, because of its large size, wasn't too used and my gut was right. I'll be replacing the six 6202 Z bearings with 6202 LL sealed on both sides. The old bearings had a grease fitting mounted on the cast iron wheels. I'll forgo that maintenance by just getting sealed ones. Their are some missing parts and D.C. Morrison Co. out of Kentucky has them all in stock. That's a real plus since Sears has no records, parts or any other info for their machine. It dates back to early to mid 1970's but Parks started making these for Sears 20 years earlier. Sears stopped making this size model around 1979. The motor looks a bit small for a statuesque machine like this, but it pulls over 15 amps on 110V and 7.7 on 220V. I'll have to see how it handles the resawing I'm asking it to do. The gearing in the back makes it look like a wood/metal band saw. I see no traces of metal shavings anywhere, so it looks like its life was spent making and collecting sawdust. This is a working saw, so I won't go overboard in the refurbishing department. Getting those bearings and blade guard and blade guides will make me a happy woodworker. 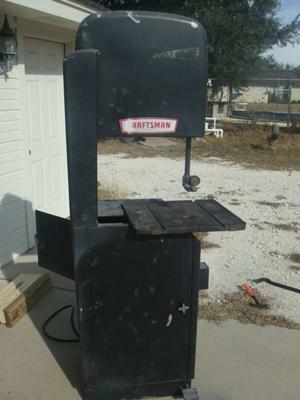 I'm looking for any info on a Craftsman 18" band saw, model #112.23611, operation, speed changes, motor H.P. requirements, ect. I've just come across a Craftsman 112-23611 that is available for parting out (or the whole thing if someone is interested...). It will be stored in another location, but at my shop tomorrow (6-12-2011) and we will take lots of pictures. If you have specific questions/requirements, we are happy to provide close-ups, etc. It is pretty much a deal Breaker if it is a metal band saw or not. The metal cutting saws have a blade cleaner that is quite rough compared to any fiber brushes that clean off the tire and the tire will be of a diferent material if meant for metal. Open the doors and look all over (stand on your head if needed and you should find some more information, but maybe not. I collect Vintage/Antique metal and woodworking machines and it seems that in older machines there wasn't always alot of information the people that bought them back then usually did so because they had a purpose not because some one that can afford it to buy equipment (because they can for a hobby) and they know nothing about them. If you notice in the directions they know who they are talking to and say things like,"Shut of the saw before grabbing the blade...it's only getting worse"
DC Morrison ( 1-888-246-6365 ) will sell you a photocopy of the manual for $10. Just picked up on similar to yours. Mine is a model 112-23600. Need 2 tires and a blade guard. Also need a diagram/parts list.